The Wundt illusion is an optical illusion where straight lines appear to be curved. The Hering illusion produces a similar, but inverted effect, and both the Wundt and Hering illusions are similar in nature to the Orbison illusion. Although the Wundt illusion and other similar illusions have not been completely explained, they has stimulated much valuable research into human perceptual processes. They have also been utilized by artists to bring about entertaining and impressive effects in their works. The Wundt illusion is named for German psychologist Wilhelm Wundt (1832-1920), who discovered the illusion in the nineteenth century. Wundt is often referred to as the "father of experimental psychology," and is responsible for discovering a number of perceptual illusions. Wundt also discovered one of the most simple line illusions, called the "horizontal-vertical illusion," where a vertical line appears much longer than a horizontal line. 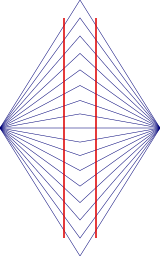 When looking at the Wundt illusion, one sees a set of vertical red lines over a figure of blue lines that radiate out from two points to the left and right of the set of red lines, meeting in the middle and creating a diamond-like shape. When observing the two red lines, they appear to bow inwards. In reality, they are perfectly straight and parallel. The distorted appearance of the two parallel red lines is created by the angled lines in the background. The exact mechanism by which we perceive the illusion is not fully understood by scientists, but it may have to do with the way the brain and visual system perceive the angles that surround the two red lines. Additionally, the illusion may be enhanced by the impression of depth created by linear perspective. Like other visual and perceptual illusions, the Wundt illusion helps scientists to study the way images are perceived and interpreted by the visual system. This page was last modified on 24 October 2016, at 16:23.